It’s 8 AM somewhere! From morning to moonset, Mother Muff’s serves up early morning cocktails and late night breakfasts. We serve a full unique breakfast menu as well as a delicious lunch and dinner menu from 8am to 12am Sunday through Wednesday and until 1am Thursday through Saturday. It’s very obvious: we really like Bacon! 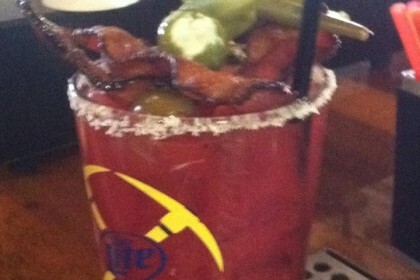 Our Mother-made Bloody Marys start with a house-juiced 8-vegetable blend and can be customized to your liking. Specialty Curfew Extender coffee cocktails, Bubble Juice Champagne cocktails, and a beer menu your Mother would love makes our drink menu the most unique in town. We hate to brag, but we also whip up house-made desserts, complemented with a Mother-made naughty milkshake. All the calories, all the fat, all the boozy goodness! Mother doesn’t judge. On Friday, Saturday and Monday nights, Mother hosts live music either in the front room or in Bloody Mary’s Back Bar. Bar favorite parlor games including pool tables, darts and a 25-foot shuffleboard table fill our downstairs in the back bar. Our Easy Like Sunday Morning Jam Brunch is every Sunday from 11am to 2pm. Great local musicians sitting in with Tim and Dylan every week! Smarty Pants Sunday starts at 7pm with Geeks Who Drink and Pikes Peak Poker makes the cards fly every Thursday at 8pm. Two Smoking Barrels Family Jam starts at 8pm every Monday night. Our Idle Hours and Mother Hours are the best Happy Hours in town! Check out our daily and weekly deals and discounts! We always have a rotating craft beer special, plus awesome happy hour deals and other weekly specials.